"815 Glen Iris Park. Interior View"
"NY Scenery, Portage & Vicinity"
This view was probably taken the same day as Photo 25. The photographer has now entered the gates shown in that photograph and has set up on lawn looking back toward the gates. The gates are visible to the left of the small pine tree just to right of center of the photograph. Note that the main part of the Glen Iris is only two stories. 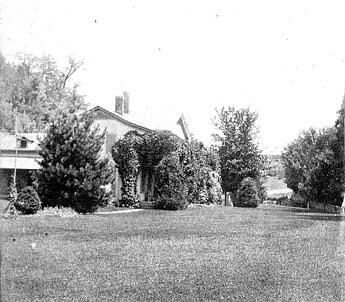 "View on Lawn at Glen Iris, Portage N.Y."
This photograph was taken from nearly the same spot several years later. The change in the height of the house is clearly visible. 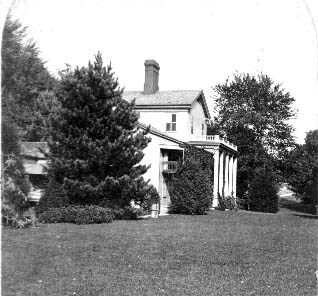 The addition of the third floor also brought changes to the porch. These changes are visible when this photo is compared to Photo 29.